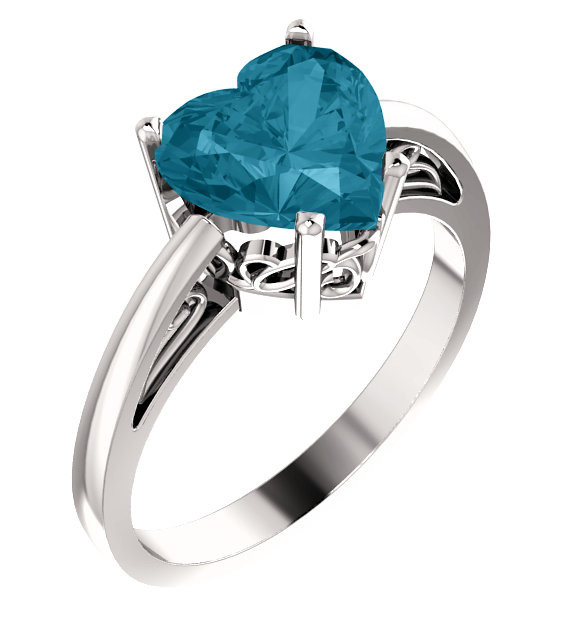 The almost oceanic like color of he London Blue Topaz gemstone featured in Apples of Gold Jewelry's London Blue Topaz heart-shaped ring in white gold will sweep you off your feet! The brilliant blue of this genuine AA rated London blue topaz stone, which is cut into a heart shape and measures 8mm by 8mm in size, looks stunning against your choice of 10K, 14K, or 18K white gold. the sweet design work on the setting of the ring adds even more beauty! We guarantee our London Blue Topaz Heart-Shaped Ring in White Gold to be high quality, authentic jewelry, as described above.